This section explains how certain ACA requirements, specifically the establishment of a health insurance marketplace (an “exchange”) and related features, will be implemented in California. The ACA mandates that every state create a health insurance marketplace, otherwise known as an “exchange.” Exchanges are places where uninsured consumers can compare selected private health insurance plans in their area. The idea is to make it easier for the public to see the costs, benefits, and quality of each plan before purchasing one. California has decided to run its own exchange; some other states have decided to let the federal government run their exchanges. Individuals and families eligible for exchange based plans will enroll and manage their coverage through California’s exchange, known as Covered California. People can shop for plans that meet their needs and level of income using a comparison tool. Insurance companies on Covered California must offer Qualified Health Plans (QHPs) that provide minimum essential coverage. These QHPs vary according to the proportions of total health costs that an average person would pay. Many different insurance companies are participating and competing in the marketplace, which keeps premiums and costs low for participants. 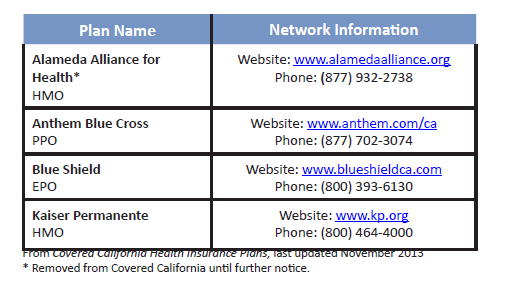 Covered California plans in Alameda County, plan types, and provider network information can be found to the right. employer-sponsored insurance. Adults under the age of 30 who do not want to pay higher premiums for plans with more comprehensive coverage can enroll in a catastrophic health plan through Covered California, which will have low monthly premiums but less coverage. Individuals and families can enroll in QHPs by phone, online, or by visiting a Certified Enrollment Entity (see page 9 for partial list of eligible entities). When individuals look to enroll, they should check to see that the physician they would like to see and the hospital that they are most likely to go to are in the network for the insurance providers that they are interested in. When a client logs onto the Covered California website and completes their secure identification information, Covered California will then show a selection of customized plans that are available to the client based on age, income, and location. When an application is completed through Covered California, there may be enough information to determine preliminary eligibility for other assistance programs (i.e., CalFresh or CalWORKs). If an applicant appears eligible for another program, they will be referred to the appropriate county agency for a final eligibility determination and enrollment into those other programs. Covered California created a new electronic database system to manage enrollment information. CalHEERS (California Health Eligibility Enrollment and Retention System) maintains all client records for Covered California plan enrollees and communicates with other databases that contain information on client income and eligibility for other programs (e.g., the Internal Revenue Service (IRS) and the Social Security Administration). CalHEERS is designed to utilize information from other county, state, and national databases that contain client identification, tax, and citizenship information. One new system to assist in enrolling people in Covered California QHPs is the Covered California Customer Service Call Center. These Centers will field enrollment, eligibility, and case management calls. Covered California will begin enrollment on October 1, 2013. Consumers can contact Covered CA at 1-888-975-1142. Calls will be answered by one of the three new state call centers in California: Concord (Contra Costa), Fresno, and Rancho Cordova (Sacramento). Number of people in the family? Anyone seeking coverage who is under age 19? Anyone seeking coverage who is pregnant? Anyone seeking coverage who is elderly or disabled? If a caller appears to be potentially eligible for Medi-Cal (California’s low-income health care program; see page 11) through the “quick sort,” the caller will be transferred to a local county-based and county-staffed customer service call center to do a Medi-Cal eligibility determination. Covered California will also perform case management of those enrolled in Covered California health care plans, including updating information, assisting with annual renewals, and managing enrollees with Advanced Premium Tax Credits (APTC) and/or Cost-Sharing Reductions. Low- to middle-income individuals and families (between138% and 400% of the Federal Poverty Level [FPL])4 that enroll in plans through Covered California may be eligible for federal subsidies, or Advanced Premium Tax Credits (APTC), for their health care coverage. These tax credits are assessed on an income-based sliding scale when they receive insurance through Covered California. APTC will lower the amount individuals will pay towards their monthly premiums. Individuals and families have the option of receiving their tax credits upfront each month to pay for the premium, or receiving their credit when they file their taxes at the end of the year. If they choose to take the upfront monthly credit, this money will go directly from the federal government to the health insurer to pay a portion of their premium. If they choose to receive the tax credit at the end of the year, the federal government will send the tax credit to the individual/family in a lump sum, similar to how they send tax refunds. The upfront monthly tax credit amount will be a projected estimate based on the income documents that the individual provided from the past year. At the end of the year, Covered California will conduct a reconciliation process that may require repayment if the subsidy given was based on incorrectly estimated income for that year. Individuals or families with income between 100% and 250% FPL may also be eligible for cost-sharing reductions, which allow them to enroll in a plan with lower out-of-pocket costs. To access these savings, an eligible individual or family must enroll in a Silver Plan through Covered California. (The lower out-of-pocket costs are reflected in the Silver Plan cost calculators available through Covered California.) The exact amount of out-of-pocket support provided will depend on the income of the individual or family enrolling in the plan. Individuals and families do not have to keep track of any cost-sharing reductions, or submit paperwork for reimbursement. Like the premium tax credits, the cost-sharing reductions are paid directly to the health insurance plan by the federal government. However, unlike the premium tax credits, for cost-sharing reductions there is no reconciliation requirement at the end of the tax year, even if individual or family income changes during the year. Navigator Program. Click here to apply to be a Certified Enrollment Entity through Covered California. subsidized and non-subsidized health plans, and encouraging individuals to retain insurance. Certain CEEs, mostly insurance agents, are compensated through the types of plans that the individuals they assist enroll in. Other entities, such as community clinics, are eligible to receive compensation for enrollment per person enrolled. There are some key differences between how Certified Enrollment Counselors (also known as IPAs) and the Navigator Program function and receive compensation. Navigators conduct broader public education activities to raise awareness about Covered California, the Qualified Health Plans, and associated policies and opportunities. Navigators are compensated through a grant. IPAs are compensated per successful application or per successful renewal.